When time permits in their schedules, the family enjoys exploring the private properties of their fellow residents. Deer of New Paltz features the friendliest, most adventurous deer located across the New Paltz area. 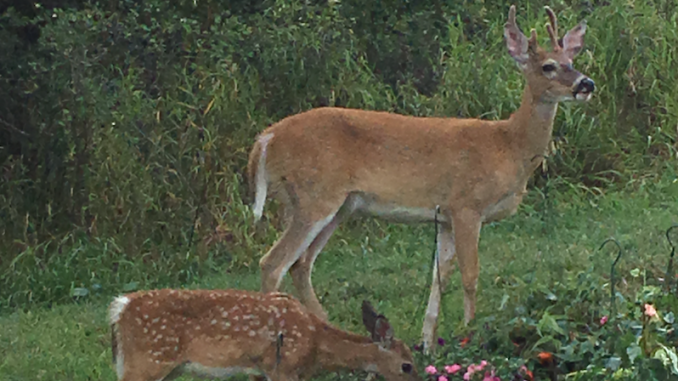 This week’s featured deer were spotted taking a break along Lookout Avenue. Late afternoon on Lookout Avenue, while I was climbing up its steep hill, I spotted a mother deer, Dawn, on the horizon, chomping away at a bush of unwatered, dying roses. As I climbed higher, I found her two children, Fawn and Spawn, not too far behind, gnawing away at the grass beneath them. Their speckled coats illuminated by the fading sunlight distracted me from noticing that they were moving towards me. Startled but curious, I stood there doe-eyed and frozen until they offered to walk me home. On our walk home, Dawn told me she came to New Paltz three years ago from a suburb outside of the city to find herself and climb mountains. One day, while she was climbing the Gunk, she met her partner– and soon to be father of her children– Jawn. His dishwashing job at Commissary wasn’t enough to support the family, so Dawn started working as a yoga instructor on weekends. Fawn and Spawn help out by working various babysitting jobs around town. All four deer are extremely hard workers and have received nothing but positive feedback from employers. When they’re not working, Dawn, Jawn, Fawn and Spawn can be found on Tuesday afternoons at Main Street Bistro for a late lunch, right before closing. Once a month Fawn’s jazz band, which includes a skunk on sax and a gopher on trumpet, closes Cafeteria’s open-mic night. On Wednesdays, after attending New Paltz Vegan Club at 7 p.m., they all head over to trivia night at Cuddy’s, and from there, to Snugs’ drawing competition. All other times they can be found either scaling a mountain, exploring town or on your front yard or eating away at your bushes.